Here is the list of the hotels near Toulouse. Book your hotel near Toulouse today, Thursday 16 May for the best price, reservation and cancellation free of charge thanks to our partner Booking.com, leader in on-line hotels reservation. Below here is the list the 50 closest hotels of Toulouse, sortable according your criteria. You will find the position of these accommodations on the Toulouse hotels map. Hotel Toulouse Preferred hotel ! Apartment Toulouse Preferred hotel ! Situated in Toulouse, Appartements Design Hypercentre provides accommodation with free WiFi. All units come with a seating area, a sofa, a flat-screen TV and a fully equipped kitchen with a dining area. A dishwasher is also provided, as well as a coffee machine and a kettle. Toulouse Stadium is 2.9 km from the apartment, while Toulouse Expo is 3 km from the property. Toulouse-Blagnac Airport is 11 km away. Situated in the heart of Toulouse, this hotel offers 24-hour service and air-conditioned rooms. It is located 140 metres from Place Wilson, and 3.5 km from Toulouse Stadium. Guests have unlimited WiFi access. Each en suite room offers a view of the Theatre de la Cité or a view of the patio.The rooms provide a flat-screen TV with satellite channels and a work desk. Breakfast is served every morning at Royal Wilson, and can be enjoyed in the lounge or in the comfort of guest rooms. Private parking is available next to the hotel and the Jean Jaurès Metro Station is 100 metres away. The Toulouse Blagnac Airport is reached by car or the shuttle service in 20 minutes. Le Clos D'Aubuisson offers self-catering accommodation apartments in the heart of Toulouse, 400 metres from Jean Jaures Metro Station. Free WiFi access is available. Each apartment has a seating area with a flat-screen TV. They also have a fully equipped kitchen and a bathroom with a shower, a hairdryer and towels. If you feel like visiting the surroundings, check out Place du Capitole (700 m) and Toulouse Stadium (2.5 km). The property is 900 m from Gare Matabiau, 3.5 km from Cité de l'espace and 7 km from Blagnac Airport. Located in the historical centre of Toulouse, just a 1-minute walk from the cafés at Place Saint-Georges, Hôtel des Arts offers individually decorated, en suite rooms and free WiFi access throughout the entire property. Toulouse Stadium is 2.8 km away. Featuring red brick walls and bright colour accents, the contemporary soundproof guest rooms have a private bathroom with hairdryer. All are equipped with a flat-screen TV and air conditioning. A continental breakfast with fresh products is available daily at Hôtel des Arts at an additional cost and can be enjoyed in the rooms. After breakfast, guests can explore the lively Capitole, which is an 8-minute walk away. Only 1.4 km from Toulouse-Matabiau Station and a 1-minute walk from Musée des Augustins, the hotel is 800 metres from the Jacobins Church. The Canal du Midi is 1 km away. Toulouse Airport is 10.5 km away. Residence Toulouse Preferred hotel ! This residence is set in the lively Place Dupuy district in Toulouse, just 3.5 km from Toulouse Stadium. It offers soundproofed accommodation with free Wi-Fi access, and is located 350 metres from Francois-Verdier Metro Station. All studios and apartments have satellite TV and a balcony, as well as a seating area and a private bathroom. They all are serviced by a lift. A fridge and coffee maker are standard in the kitchenettes in the At Home Appart Hotel. Enjoy a buffet breakfast every morning while reading the newspapers provided. Saint-Etienne Cathedral is 550 metres from the At Home residence and Capitole Square is 1 km away. Private parking is available on site. Set in the Matabiau district in Toulouse, 3.4 km from Toulouse Stadium, Le Saint-Aubin offers an equipped accommodation with an terrace and free WiFi. The apartment is 3.7 km from Toulouse Expo. This apartment is fitted with a living room and a fully equipped kitchen with a microwave. A flat-screen TV is provided. Zénith de Toulouse is 5 km from Le Saint-Aubin, while Amphitheatre Purpan-Ancely is 7 km away. The nearest airport is Toulouse-Blagnac Airport, 10 km from the property. Situated in Toulouse, 2.6 km from Toulouse Stadium and 2.7 km from Toulouse Expo, Appartement Centre historique Toulouse provides accommodation with amenities such as free WiFi and a flat-screen TV. Guests staying at this apartment have access to a fully equipped kitchen. The apartment includes a living room and 1 bathroom with free toiletries and a bath. Private parking is available at the apartment. A bicycle rental service is available at Appartement Centre historique Toulouse. Zénith de Toulouse is 3.1 km from the accommodation. The nearest airport is Toulouse-Blagnac Airport, 10 km from Appartement Centre historique Toulouse. T4 du Languedoc offers accommodation in Toulouse, 2.4 km from Toulouse Stadium and 2.7 km from Toulouse Expo. Complimentary WiFi is offered. This air-conditioned apartment is fitted with 2 bedrooms, a cable flat-screen TV, a dining area, a kitchen and a living room. Zénith de Toulouse is 4.2 km from the apartment, while Amphitheatre Purpan-Ancely is 7 km from the property. The nearest airport is Toulouse-Blagnac Airport, 12 km from the property. Appartement Castellane is an accommodation located in Toulouse, 3.8 km from Toulouse Stadium and 4.1 km from Toulouse Expo. This apartment is 6 km from Zénith de Toulouse. The apartment is composed of 1 bedroom, a living room, a fully equipped kitchenette, and 1 bathroom. A flat-screen TV is offered. Amphitheatre Purpan-Ancely is 7 km from the apartment. Toulouse-Blagnac Airport is 10 km away. This hotel is located in central Toulouse, 100 metres from the Capitole Metro station. It has a flowered courtyard and a spa area with a sauna, hammam and massage treatments. Free WiFi is available throughout. The Grand Hotel de l’Opera offers air-conditioned rooms with classic décor and equipped with free Wi-Fi, satellite TV and a private bathroom with slippers and a bathrobe. Some rooms have a seating area. The Grand Hotel features 2 large restaurants that serve refined cuisine and a buffet breakfast daily. Guests can enjoy a drink at the hotel’s bar. There is a 24-hour reception with a porter, and valet service is available on site. Guests can easily explore the main attractions of the Pink City. The Hotel de l’Opera is situated opposite the famous Theatre du Capitole, 5 km from Toulouse Stadium and Basilica Saint-Sernin is just a 5-minute walk away. Set 1.6 km from Toulouse Expo and 2.2 km from Toulouse Stadium, Duplex design en hypercentre offers accommodation in Toulouse. The apartment is 400 metres from the Place du Capitole and 750 from Les Carmes area. The unit equipped with a kitchen with an oven, microwave and coffee machine. A flat-screen TV is provided. A public car park is available 200 metres from the property next to Esquirol subway station. Amphitheatre Purpan-Ancely is 4 km from Duplex design en hypercentre. Toulouse-Blagnac Airport is 7 km away. Situated 3.5 km from Toulouse Stadium and 3.8 km from Toulouse Expo, Welkeys Apartment - Fonvieille is located in Capitole of Toulouse. This apartment also features free WiFi. This apartment features a living room and a fully equipped kitchen. A TV is available. Zénith de Toulouse is 5 km from the apartment, while Amphitheatre Purpan-Ancely is 7 km away. The nearest airport is Toulouse-Blagnac Airport, 10 km from the property. Located in the centre of Toulouse, this 3-star hotel is just in front of Esquirol Metro Station and 3 km from Toulouse Stadium. It offers free WiFi access and en suite rooms serviced by an elevator. All the air-conditioned rooms at Hôtel Le Père Léon are soundproofed and feature a flat-screen TV with satellite channels. They provide a private bathroom with free toiletries, a hairdryer and a bath or shower. Some are suitable for guests with reduced mobility. A buffet breakfast is served every morning at Hôtel Le Père Léon. Restaurants and cafés can be found within 350 metres of the property. This hotel is 180 metres from the Augustins Museum and a 3-minute walk from the Garonne River. Saint-Sernin Basilica is a 15-minute walk away. Studio tout équipé proche centre et canal du midi in Toulouse features accommodation with free WiFi, 3.3 km from Toulouse Stadium. With river views, this accommodation provides a balcony. The apartment is fitted with a flat-screen TV. The accommodation is equipped with a kitchen with a microwave and fridge. A bicycle rental service is available at the apartment. Toulouse Expo is 3.6 km from Studio tout équipé proche centre et canal du midi, while Zénith de Toulouse is 5 km from the property. The nearest airport is Toulouse-Blagnac Airport, 11 km from the property. Featuring a terrace, Le charme de l'ancien offers accommodation in Toulouse, 2.9 km from Toulouse Stadium and 3 km from Toulouse Expo. Guests staying at this apartment have access to free WiFi, a fully equipped kitchen, and a balcony. Zénith de Toulouse is 3.3 km from the apartment. The nearest airport is Toulouse-Blagnac Airport, 11 km from Le charme de l'ancien. Situated in Toulouse, 3.2 km from Toulouse Stadium and 3.5 km from Toulouse Expo, Loft 9 Rue Fermat offers free WiFi and air conditioning. Guests staying at this apartment have access to a terrace. The apartment comes with 2 bedrooms, a flat-screen TV with cable channels and a fully equipped kitchen that provides guests with a dishwasher, an oven, a washing machine, a microwave and a toaster. The apartment also offers 1 bathroom. Zénith de Toulouse is 3.6 km from the apartment. The nearest airport is Toulouse-Blagnac Airport, 11 km from the property. Hypercentre design et lumineux offers pet-friendly accommodation in Toulouse. The air-conditioned apartment is 200 metres from Place du Capitol and a 1-minute walk from Esquirol Metro Stop. Free WiFi is available . The kitchen is equipped with a dishwasher, an oven and a microwave, as well as a coffee machine and a kettle. Towels and bed linen are featured in this apartment. Toulouse Stadium is 2.5 km from Hypercentre design et lumineux, while Zénith de Toulouse is 3 km from the property. The nearest airport is Toulouse-Blagnac Airport, 7 km from the property. Situated in Toulouse, 4 km from Toulouse Stadium, Résidence le Pastel François Verdier provides accommodation with access to a garden. Free WiFi is provided. The apartment provides guests with a patio, a seating area, cable flat-screen TV, a fully equipped kitchen with a microwave and a toaster, and a private bathroom with bath and free toiletries. A fridge and kettle are also featured. Résidence le Pastel offers a terrace. Toulouse Expo is 4.3 km from the accommodation. The nearest airport is Toulouse-Blagnac Airport, 11 km from the property. Set in the heart of Toulouse, a 20-minute drive from Blagnac Airport and 2 km from Toulouse Stadium, Hôtel Croix Baragnon offers free WiFi throughout and rooms overlooking the street or the flowery courtyard. In the morning, a buffet breakfast is available and there is a gastronomic restaurant down the street. There is also a supermarket 250 metres away. The bedrooms at Hôtel Croix Baragnon have a flat-screen TV and a private bathroom with free toiletries. Matabiau Rail Station can be reached on foot in just over 20 minutes. Augustins Museum, Carmes District, Saint Etienne Cathedral and Capitole Square are all less than 5 minutes’ walk away. La terrasse St Georges in Toulouse provides accommodation with free WiFi, 3.7 km from Toulouse Stadium, 4 km from Toulouse Expo and 4.3 km from Zénith de Toulouse. With city views, this accommodation offers a terrace. The apartment includes 2 bedrooms, a living room, and 1 bathroom with a hair dryer. There is a seating area and a kitchen complete with a dishwasher, an oven and a microwave. Amphitheatre Purpan-Ancely is 7 km from the apartment, while Jardin Royal is 1.6 km away. Toulouse-Blagnac Airport is 10 km from the property. Set 2.9 km from Toulouse Stadium and 3 km from Toulouse Expo in Toulouse, Ô Briques de Toulouse offers accommodation with a kitchen. The accommodation is 3.4 km from the Zénith de Toulouse. Amphitheatre Purpan-Ancely is 6 km from the apartment, while Le Pont Neuf is 800 metres from the property. The nearest airport is Toulouse-Blagnac Airport, 11 km from the property. Located in the centre of Toulouse, just 4 km from Toulouse Stadium, this air-conditioned hotel offers a sauna, hot tub and a fitness centre. Contemporary rooms provide a minibar and LCD TV, and Toulouse-Matabiau Train Station is 1 km away. Each soundproofed guest room includes free Wi-Fi access and a radio. Some of the rooms offer an iPod dock, a Nespresso coffee machine or a rain shower. Breakfast can be taken in the room upon request. A buffet breakfast is prepared every morning at the Novotel Toulouse Centre Wilson. The restaurant, La Brasserie du Capoul, features a terrace and you can enjoy snacks and musical entertainment in the bar. A play area with video games and a concierge service are among the additional facilities available. Saint Sernin Basilica is only 900 metres from this hotel and Place du Capitole is a 2-minute walk away. Toulouse-Blagnac Airport is 11 km away, and a shuttle to the airport can be found 200 metres away at the Jean Jaures bus stop. Le Patio des Carmes in Toulouse provides accommodation with free WiFi, 2.3 km from Toulouse Stadium. The property is 2.6 km from Toulouse Expo. Situated on the ground floor, this apartment features with 1 bedroom, a well-equipped kitchen with a dishwasher, a living room, and a TV. Zénith de Toulouse is 3.2 km from the apartment. The nearest airport is Toulouse-Blagnac Airport, 11 km from Le Patio des Carmes. Set in the heart of Toulouse, 400 metres from François Verdier Metro Station, 150 metres from the Canal du Midi, and a 12-minute walk from Capitole Square and tramway T2 which goes to the airport. Le Studio des Potiers is south-facing and has large double-glazed windows, parquet flooring and a balcony.Facilities include a sofa, a desk, flat-screen TV, stereo, free WiFi and free phone calls to landlines in 70 countries. The bathroom comes with a large shower, hairdryer, shampoo and shower gel. Towels and bed linen are included and ironing facilities and cleaning products are provided. The fully equipped kitchen comes with an oven, microwave, toaster, kettle, coffee machine, dishwasher, refrigerator, hot plates, washing machine and clothes dryer. Grocery shops, a bakery and restaurants can be found within walking distance. Featuring city views, Superbe studio cosy Metro Jean Jaures is situated in Toulouse, 3.8 km from Toulouse Stadium. This apartment is 4.1 km from Toulouse Expo. The 1-bedroom apartment comes with a living room with a flat-screen TV, a fully equipped kitchen with an oven, and 1 bathroom. Zénith de Toulouse is 6 km from the apartment, while Amphitheatre Purpan-Ancely is 7 km away. The nearest airport is Toulouse-Blagnac Airport, 10 km from the property. 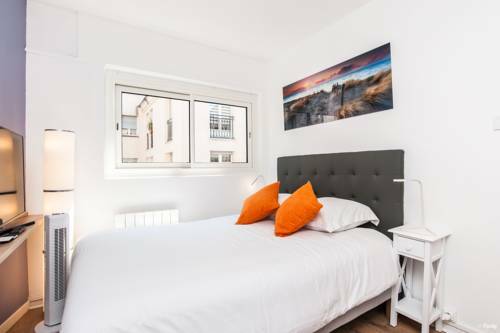 Studio Aqueduc offers accommodation in Toulouse. The kitchenette is equipped with a microwave and a refrigerator. A flat-screen TV with satellite channels is offered. Toulouse Expo is 2.2 km from Studio Aqueduc, while Zénith de Toulouse is 3.9 km from the property. Blagnac Airport is 8 km away. Situated 2.4 km from Toulouse Stadium in Toulouse, Studio des Carmes offers accommodation with a kitchenette. It is set 2.7 km from Toulouse Expo and provides free WiFi. The apartment has 1 bedroom and 1 bathroom with free toiletries and a hair dryer. A flat-screen TV is offered. Zénith de Toulouse is 3.2 km from the apartment. The nearest airport is Toulouse-Blagnac Airport, 11 km from Studio des Carmes. Hotel de Toulouse Centre Canal du Midi (futur Ibis Style) is located in the centre of Toulouse on the edge of Canal du Midi and next to Halle aux Grains concert hall, just 1 km from Capitole Square and 3.5 km from Toulouse Stadium. Free Wi-Fi access is available. The air-conditioned guest rooms at Hotel de Toulouse Centre Canal du Midi (futur Ibis Style) include a private bathroom with a bathtub and hairdryer. A flat-screen TVis also featured in each room. The rooms are accessed via a lift. A continental breakfast buffet is served every morning. Hotel de Toulouse Centre Canal du Midi (futur Ibis Style) provides a 24-hour front desk and complimentary newspapers. Private parking is available at a surcharge. The hotel is a 10-minute walk from Toulouse-Matabiau Train Station and 4 km from the Exhibition Centre. Toulouse-Blagnac airport is a 15-minute drive away. Metro Station François Verdier is a 5-minute walk away. There is an underground, secure car park available at an extra cost. Place Pt Thomas WILSON offers accommodation in Toulouse, 3.6 km from Toulouse Stadium and 3.9 km from Toulouse Expo. Featuring city views, this apartment also provides guests with free WiFi. This apartment features 2 bedrooms, a kitchen with a dishwasher and a oven, a flat-screen TV, a seating area and 2 bathrooms with a bath. Private parking is available at the apartment. Zénith de Toulouse is 5 km from Place Pt Thomas WILSON. Toulouse-Blagnac Airport is 10 km from the property. Conveniently situated in Capitole of Toulouse, Appartement cocooning en hyper centre-Saint Etienne features a bar and free WiFi. The accommodation is 3.2 km from the Toulouse Stadium. The apartment is equipped with 1 bedroom, a kitchen with microwave and toaster, and 1 bathroom with a shower, a hair dryer and a washing machine. A flat-screen TV is featured. Both a bicycle rental service and a car rental service are available at the apartment. Toulouse Expo is 3.5 km from Appartement cocooning en hyper cent, while Zénith de Toulouse is 3.5 km from the property. The nearest airport is Toulouse-Blagnac Airport, 11 km from the property. Appartement Nazareth - Duplex Hyper Centre (Carmes) in Toulouse provides accommodation with free WiFi, 2.5 km from Toulouse Stadium. The property, housed in a building dating from 19th century, is 2.8 km from Toulouse Expo and 4.2 km from Zénith de Toulouse. The 1-bedroom apartment comes with a living room with a TV, a fully equipped kitchen and 2 bathrooms. Amphitheatre Purpan-Ancely is 7 km from the apartment, while Jardin Royal is 700 metres away. The nearest airport is Toulouse-Blagnac Airport, 12 km from the property. Located in Toulouse, 2.7 km from Toulouse Stadium and 2.8 km from Toulouse Expo, Welkeys Apartment - Rue des Tourneurs provides accommodation with amenities such as free WiFi and a TV. Guests staying at this apartment have access to a fully equipped kitchen. Zénith de Toulouse is 3.1 km from the apartment, while Amphitheatre Purpan-Ancely is 6 km from the property. The nearest airport is Toulouse-Blagnac Airport, 11 km from Welkeys - Rue des Tourneurs. Beau Rivage offers accommodation in Toulouse, 3.7 km from Toulouse Stadium and 4 km from Toulouse Expo. Free WiFi is available in the apartment, located 5 km from Zénith de Toulouse. Beau Rivage features a flat-screen TV, a well-equipped kitchen with a dishwasher, and 1 bathroom with a shower and a hair dryer. Amphitheatre Purpan-Ancely is 8 km from the accommodation, while Jardin Royal is 1.4 km away. The nearest airport is Toulouse-Blagnac Airport, 11 km from the property. Offering free WiFi and city views, Villa luxueuse & moderne provides accommodation set in Toulouse, just less than 1 km from Jardin Royal. The air-conditioned accommodation is 3 km from Toulouse Stadium. The villa comes with a flat-screen TV, 3 bedrooms and a living room. Toulouse Expo is 3.3 km from the villa. Toulouse-Blagnac Airport is 11 km from the property. Welkeys Apartment - Velane offers accommodation in Toulouse, a 17-minute walk from Toulouse Expo. This apartment also has free WiFi. This apartment has a living room and a fully equipped kitchenette with a dishwasher and an oven. A TV is available. Toulouse Stadium is 1.9 km from the apartment, while Zénith de Toulouse is 3.3 km from the property. Toulouse-Blagnac Airport is 7 km away. Set in Toulouse, this apartment is 2 km from Toulouse Expo. Appartement Toulouse Capitole features views of the garden and is 2.5 km from Toulouse Stadium. Free WiFi is featured throughout the property. The unit equipped with a kitchen with a microwave and fridge. Towels and bed linen are provided in this apartment. There is a private bathroom with a bath or shower. Zénith de Toulouse is 3.4 km from Appartement Toulouse Capitole, while Amphitheatre Purpan-Ancely is 5 km from the property. The nearest airport is Toulouse-Blagnac Airport, 7 km from Appartement Toulouse Capitole. Set in Toulouse, 3.8 km from Toulouse Stadium, Welkeys Apartment - Regourd offers a living room with a TV. Guests staying at this apartment have access to free WiFi. This apartment is fitted with 2 bedrooms, a living room and a fully equipped kitchen with an oven and a microwave. Toulouse Expo is 4.1 km from the apartment, while Zénith de Toulouse is 6 km away. The nearest airport is Toulouse-Blagnac Airport, 11 km from Welkeys Apartment - Regourd. Located 3 km from Toulouse Stadium, Appartement Hypercentre Climatisé avec Wifi is set in Capitole of Toulouse. This property is 3.1 km from Toulouse Expo and features free WiFi. The air-conditioned apartment consists of 1 bedroom, a kitchen with dining area, and 1 bathroom. A flat-screen TV is available. Zénith de Toulouse is 3.4 km from the apartment. The nearest airport is Toulouse-Blagnac Airport, 11 km from the property. Le Duplex is set in the Matabiau district of Toulouse, 3.7 km from Toulouse Stadium and 4 km from Toulouse Expo. Guests have a private balcony. This 1-bedroom apartment comes with a kitchenette, a seating area, and a satellite flat-screen TV. Zénith de Toulouse is 5 km from the apartment, while Amphitheatre Purpan-Ancely is 8 km from the property. The nearest airport is Toulouse-Blagnac Airport, 11 km from the property. Set 3.7 km from Toulouse Stadium and 4 km from Toulouse Expo, Appartement Halle aux Grains Place Dupuy is located in Matabiau of Toulouse. The air-conditioned accommodation is 5 km from Zénith de Toulouse. 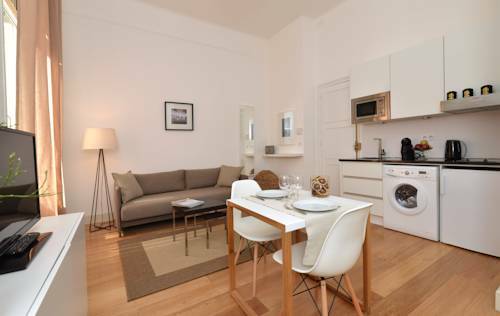 The apartment features 1 bedroom and a fully fitted kitchen with a dishwasher and an oven. A flat-screen TV is offered. Amphitheatre Purpan-Ancely is 8 km from the apartment, while Jardin Royal is 1.4 km from the property. The nearest airport is Toulouse-Blagnac Airport, 11 km from the property. Just 300 metres from Le Pont Neuf and 1.6 km from Jardin Royal and featuring free WiFi, Appartement hyper centre offers accommodation in Toulouse. The property features city views and is 2.5 km from Toulouse Stadium. The apartment comes with a flat-screen TV and 1 bedroom. A microwave, a fridge and a stovetop can be found in the kitchen. Toulouse Expo is 2.6 km from the apartment. The nearest airport is Toulouse-Blagnac Airport, 10 km from the property. Set in Toulouse, just 2.7 km from Toulouse Stadium, Welkeys Studio Toulouse features accommodation with free WiFi. This property is 2.8 km from Toulouse Expo. The apartment is fitted with 1 separate bedroom and includes a kitchenette with an oven and a dining area. Zénith de Toulouse is 3.1 km from the apartment. Toulouse-Blagnac Airport is 11 km away. Apart'Hotel Capoul offers accommodation in Toulouse, on Place Wilson. Set next to the 4-star Grand Hôtel Capoul. Each accommodation features 2 bedrooms and a seating area with a satellite flat-screen TV, blu-ray player, and DVD player. All units have a kitchen equipped with a dishwasher and oven. A microwave and coffee machine are also featured. Each unit is fitted with a private bathroom with free toiletries. Towels and bed linen are provided. Apart'Hotel Capoul also includes a spa centre, hot tub, and sauna. Guests can enjoy the on-site bar and restaurant. Toulouse Stadium is 2.6 km from Apart'Hotel Capoul. The nearest airport is Toulouse-Blagnac Airport, 7 km from the property. The 4-star Citiz Hotel is located on Place Wilson in Toulouse, a 5-minute walk from the Capitole and a 10-minute walk from Matabiau Train Station. The air-conditioned guestrooms have LCD satellite TV and free WiFi. Guests of the Citiz Hotel can relax with a free newspaper in the hotel’s restaurant and bar. All guestrooms at the Citiz also have a hairdryer, minibar and a courtesy tray. Blagnac Toulouse Airport is a 15-minute drive from the Citiz Hotel. Pierre Baudis Centre des Congrès is a 3-minute metro ride away from Capitole Metro Station. There is a public car park just in front of the hotel and the airport shuttle stops right next to the hotel. Toulouse Stadium is 4 km away. Locaday is situated in the Capitole district of Toulouse, 3.5 km from Toulouse Stadium and 3.8 km from Toulouse Expo. The property features city views, plus is 5 km from Zénith de Toulouse. The apartment has 1 bedroom, a living room, and a kitchen with a dishwasher. Private parking is available at the apartment. Amphitheatre Purpan-Ancely is 7 km from Locaday, while Place du Capitole is 2.9 km from the property. The nearest airport is Toulouse-Blagnac Airport, 10 km from the accommodation. Below here is the hotels map of Toulouse. Names and details of Toulouse hotels can be shown on the map clicking on the prices icons.